This sky map shows how the Big Dipper appears in the summer sky at 10 pm to observers mid-northern latitudes in June 2012. If you step outside and look skyward as soon as darkness falls on these summer evenings, chances are you'll be able to pick out one of the most prominent and recognizable celestial patterns: the Big Dipper. If you live in the Northern Hemisphere you only need to look high toward the northwest sky to find the seven bright stars that make up the famous Big Dipper. For most stargazers, the Big Dipper is probably the most important group of stars in the sky. For anyone at the latitude of New York (41 degrees north) or all points northward, the Big Dipper never sinks below the horizon. It is one of the most recognizable star patterns in the sky and therefore one of the easiest for the novice to find. In other parts of the world, these seven stars are known not as a Dipper, but as some sort of a wagon. In Ireland, for instance, it was recognized as "King David’s Chariot," from one of the island’s early kings; in France, it was the "Great Chariot." Another popular name was Charles’ Wain (a wain being a large open farm wagon). And in the British Isles, these seven stars are widely known as "The Plough." There is even a reference in the Bible: Amos 5:8 refers to it as "the seven stars." The Big Dipper is not a constellation in itself, but rather only a part of a much larger group of stars that is officially recognized as a constellation: Ursa Major, the Great Bear. The origin of the Big Dipperitself has been a source of frustration to some constellation historians. Where exactly did this name come from? Nobody seems to know. Some believe that it may have originated from Africa, where it was sometimes seen as a drinking gourd. Of greatest importance is the ability to use the Big Dipper to locate Polaris, the North Star. This is made possible by the two bright stars that mark the outer edge of the bowl of the Big Dipper. These two stars — Dubhe and Merak — are known as the Pointers, because they always point to Polaris. To find the North Star, just draw an imaginary line between these two stars and prolong it about 5 times; the line will ultimately hit a moderately bright star, which is Polaris. 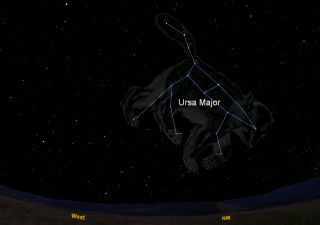 The fact that the Big Dipper also formed a bear to American Indians and to cultures of the Old World and Siberia suggests that our Ursa Major is a very ancient star pattern. Long ago, when the forms of animals and heroes were pictured against the stars, a large bear was represented in this particular region, a bear with a surprisingly long tail (because the Dipper has a long handle). In fact, it is a piece of Stone Age culture that is probably at least 8,000 to 12,000 years old, which is the estimated era of the last migration from Siberia to North America across the Bering Strait. In fact, the far-northern region of the world, where this starry figure wheels high in the heavens, came to be known as the Arctic region — the abode of Arktos, which in Greek literally meant "bearish." The Big Dipper also graces a state flag in the United States. We can thank a 13-year-old boy, John Bell "Benny" Benson, with the celestial design that now adorns the Alaska state flag. Benson, who lived in the village of Chignik, entered a contest sponsored by the Alaska Department of the American Legion in 1926. The prize — a $1,000 trip to Washington, D.C. and a gold watch engraved with the flag — was awarded to Benson in 1927. But because his father was ill and then-President Calvin Coolidge was out of the country, Benson never made the trip. Instead, the $1,000 was put toward his education instead. The Territorial Legislature adopted the flag in May 1927 as Alaska's official flag, and when Alaska entered the Union in 1959, the territorial flag was adopted for official state use. Young Benson's design was selected for its simplicity, originality and symbolism. The flag's blue field represents the Alaska's evening sky, the blue of the sea and of mountain lakes, as well as the state's wildflowers. Emblazoned on the flag are eight gold stars: seven of which belong to the constellation of Ursa Major, and form the Big Dipper. The eighth star incorporated into the flag is Polaris, the North Star. Ursa Major was chosen because it was considered to be the most conspicuous constellation in the northern sky, while Polaris is the ever-constant star for the mariner, the explorer, hunter, trapper, prospector, woodsman and the surveyor. Unfortunately, our familiar Dipper will not last forever. Of the seven stars that make up this pattern, five apparently belong to a loosely joined swarm of stars, all hurtling through space at roughly the same speed and in the same direction. These five stars are located some 78 to 84 light-years from Earth. But, two of the stars — Dubhe (the northern Pointer) and Alkaid (the star at the end of the handle) — are not part of the swarm and appear to be rushing at even greater speeds in the opposite direction. Alkaid is 101 light-years away, while Dubhe is 124 light-years from Earth. These opposing motions will slowly alter the form of the Big Dipper. In short, our Dipper is slowly going to pieces. The bent handle will eventually bend more as time wears on, while the bowl will spread. Granted, it will still resemble a dipper for about the next 25,000 years, but 50,000 years from now it will be hopelessly out of shape.